Objective To assess the impact of hypothermic neural rescue for perinatal asphyxia at birth on healthcare costs of survivors aged 6–7 years, and to quantify the relationship between costs and overall disability levels. Design 6–7 years follow-up of surviving children from the Total Body Hypothermia for Neonatal Encephalopathy (TOBY) trial. Setting Community study including a single parental questionnaire to collect information on children’s healthcare resource use. Patients 130 UK children (63 in the control group, 67 in the hypothermia group) whose parents consented and returned the questionnaire. Interventions Intensive care with cooling of the body to 33.5°C for 72 hours or intensive care alone. Main outcome measures Healthcare resource usage and costs over the preceding 6 months. Results At 6–7 years, mean (SE) healthcare costs per child were £1543 (£361) in the hypothermia group and £2549 (£812) in the control group, giving a saving of −£1005 (95% CI −£2734 to £724). Greater levels of overall disability were associated with progressively higher costs, and more parents in the hypothermia group were employed (64% vs 47%). Results were sensitive to outlying observations. Conclusions Cost results although not significant favoured moderate hypothermia and so complement the clinical results of the TOBY Children study. Estimates were however sensitive to the care requirements of two seriously ill children in the control group. A quantification of the relationship between costs and levels of disability experienced will be useful to healthcare professionals, policy makers and health economists contemplating the long-term economic consequences of perinatal asphyxia and hypothermic neural rescue. Trial registration number This study reports on the follow-up of the TOBY clinical trial: ClinicalTrials. gov number NCT01092637. The benefits of hypothermic neural rescue in terms of cognitive and disability-free survival persist into middle childhood. Data on long-term costs following perinatal asphyxia and hypothermia have not previously been reported. New comparative data on healthcare costs at 6–7 years after hypothermia plus intensive care and intensive care alone for perinatal asphyxia. A quantification of healthcare costs by level of disability, in survivors of perinatal asphyxia. 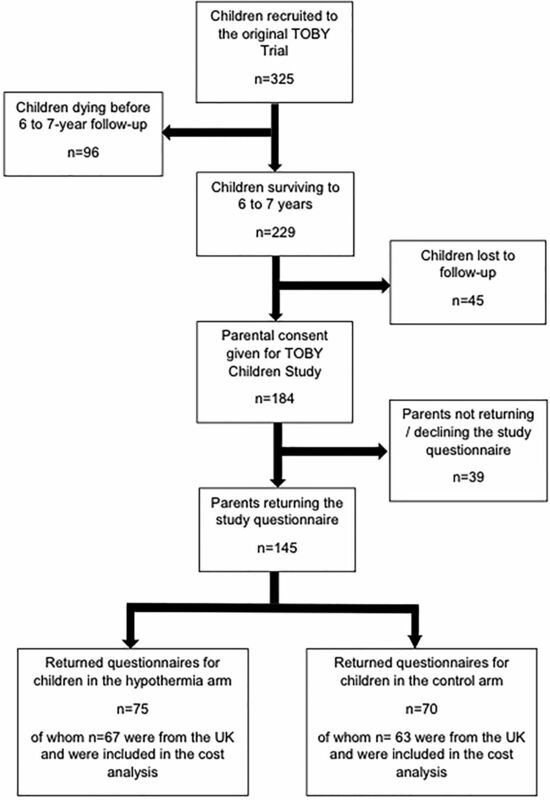 To address this lack of long-term data and as part of the 6–7 years follow-up of surviving children in the TOBY trial, data were collected on children’s healthcare resource use and health-related quality of life (HRQoL).5 12 The objectives of this substudy were to describe resource use and costs at 6–7 years in each trial arm and to quantify healthcare costs by overall disability level. As part of that study, parents received a postal questionnaire including questions about the use of healthcare services by their child over the previous 6 months and the HRQoL Health Utilities Index (results of which are reported elsewhere).13 The TOBY trial included centres from the UK, Sweden, Hungary, Finland and Israel, with UK centres contributing over 85% to the total sample size. The questionnaire contained a list of healthcare professionals and services likely to be used by TOBY Study children across primary, community and secondary care (column 1 of table 1). Parents recorded whether their child had any contact with each professional/service in the previous 6 months as well as the number of contacts. For contacts with hospitals, parents reported the reason, and the duration and ward type for any inpatient admissions. Parents could also report contacts with any other professionals (shown in column 1 of table 1 under the heading of ’Miscellaneous clinics/therapist sessions'). For each child, costs were estimated by multiplying the numbers and/or durations recorded for each type of contact by appropriate unit costs obtained primarily from national sources.14 15 These unit costs are also shown in table 1, expressed in 2015–2016 UK Pound Sterling. It is accepted that clinical practice, healthcare resource use and unit costs can vary between countries, and so simply aggregating multinational data for a cost analysis will likely generate findings that are not meaningful or representative to any one country.16 17 In view of this and with 89.7% of questionnaire responses received from the UK (9.7% were from Hungary, and 0.6% from Finland), only UK data were used for the analysis. In addition to the comparative cost analysis, the relationship between total healthcare costs and overall disability levels at 6–7 years was explored. Given the skewness in the data, a generalised gamma model with a log link function was used to regress total costs against overall disability levels (none, mild, moderate and severe—see footnote to table 2 for level descriptions), while controlling for trial arm and characteristics at trial entry (delivery complications at birth (yes/no), gestational age at birth (weeks), birth weight (g) and gender). A modified Park test was used to confirm the appropriateness of the gamma model.22 23 Rubin’s rule was also implemented to generate the combined regression coefficients and associated SEs across MI datasets. All analyses were conducted in Stata MP V.13 (Stata Statistical Software, 2013, StataCorp, College Station, Texas, USA). Sensitivity analysis explored the significance of outlying observations; two children in the control arm spent considerably more nights in hospital than other children requiring inpatient care. 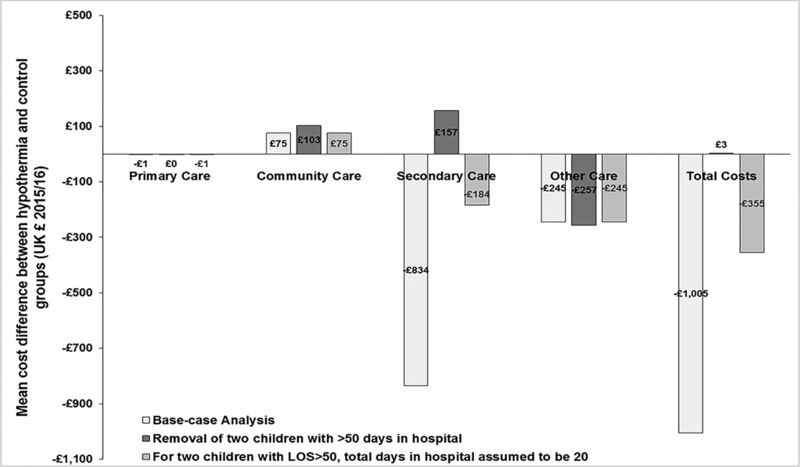 In a first analysis, the two children were removed and in a second analysis, their days in hospital were replaced by the longest length of stay observed among other children requiring inpatient care (20 days). Figure 1 shows the flow of children through the study. Of the 229 TOBY trial survivors at 6–7 years, 184 (80%) parents/carers consented to participate in the main TOBY Children study and 45 (20%) were lost to follow-up. One hundred and forty-five of the 184 consenting parents (79%) returned the study questionnaire and 39/184 (21%) either did not respond or declined the questionnaire. The 130/145 (90%) responses from the UK form the sample for this study. Flow of children through the study. TOBY, Total Body Hypothermia for Neonatal Encephalopathy. Sixty-seven children were from the hypothermia arm and 63 from the control arm. There were no differences between arms with regard to baseline demographics or clinical characteristics at trial entry (table 2). Differences in clinical outcomes at 6–7 years were comparable to those observed for survivors in the wider TOBY Children study population; a higher proportion of children in the hypothermia group had normal neurological functioning and an IQ score ≥ 85, and fewer had moderate or severe levels of disability. More carers were in employment in the hypothermia group. There were no differences between the 145 children whose parents returned the study questionnaire and the subsample of 130 UK children (online supplementary appendix table A1). There were also no differences between the 130 UK children and the 39 children whose parents consented to the study but did not return the questionnaire (online supplementary appendix table A1). Among these 39 non-responding families (and as observed for the responding families), a higher proportion of children in the hypothermia group had an IQ≥85 (16/23 (70%) vs 9/16 (56%), p=0.394) and had normal neurological functioning (14/23 (61%) vs 6/16 (38%), p=0.151). Base-case mean healthcare contacts and costs estimated using the multiple imputation data are summarised in table 3 (additional details of the missing data, and the impact of multiple imputation are discussed in the online supplementary appendix, tables A2–A4). For many of the healthcare contacts, mean usage and costs were similar in both trial arms (table 3). In contrast, inpatient admission costs were noticeably lower in the hypothermia group (mean difference −£817 (−£2141 to £508)). Although the proportion of children with at least one hospital inpatient admission in each arm was similar (11.1% vs 10.8%), in the control arm the mean total time in hospital was greater (19.9 vs 6.6 days) due to two children spending a total of 53 and 58 days in hospital (see online supplementary appendix table A4). One admission for epilepsy required a prolonged stay (14 days) in intensive care. Children in the control group also appeared to need greater input from other specialists. The mean cost difference for these ‘other’ services favoured the hypothermia group at −£245 (−£555 to £64), but was not statistically significant. The total mean NHS cost per child over the 6-month period was £2549 (£812) in the control group and £1543 (£361) in the hypothermia group, giving a non-statistically significant difference of −£1005 (−£2734 to £724) favouring hypothermia. When modelling costs, the modified Park test showed the gamma model to be most appropriate when compared with models using Poisson, inverse Gaussian and Gaussian distributions. Table 4 shows the estimated coefficients from the regression model. The multiplicative effect of each coefficient is also reported. The coefficients for each disability level increase with severity, and those for moderate and severe levels are statistically significantly greater than the reference category of no disability. The model was used to estimate mean total healthcare costs for each of the four disability levels for an average child in the TOBY trial (a male, born at 40 weeks, having delivery complications, a birth weight of 3400 g and receiving hypothermia) (see online supplementary appendix for the approach used). The resulting estimated mean total cost for a child with no disabilities was £450, with mild disabilities was £1043 (95% CI £363 to £2998), with moderate disabilities was £5651 (95% CI £1715 to £18 624) and with severe disabilities was £12 335 (95% CI £5238 to £29 049). Excluding the two children in the control arm who each spent >50 days in hospital had a substantial impact on the comparative cost results. Figure 2 shows how the mean total cost difference of −£1005 favouring hypothermia disappeared and the mean cost saving in secondary care of −£834 was replaced by a cost increase of £157. Retaining both children but replacing their time in hospital with 20 days reduced the mean secondary care cost difference from −£834 to −£184 and the mean total cost difference by two-thirds from −£1005 to −£355 in favour of hypothermia. Mean cost differences between hypothermia and control groups for different healthcare sectors and overall. Results shown for the base-case and sensitivity analysis. LOS, length of stay. Re-estimating the regression model after removing the two outlying children reduced the coefficient for the severe disability level from 3.31 to 2.68, that is, relative to a child with no disability, costs for a child with a severe disability were estimated to be 14 times greater rather than 27 times greater as in the base-case analysis (table 4). Results were highly sensitive to the hospital inpatient length of stays of two children in the control group. Both had severe neurodevelopmental disability and multiple handicaps and spent considerably more days in hospital than any other children in the study. During the 6-month recall period, total healthcare costs for these two children amounted to £26 477 and £40 129 and demonstrate that the needs of children with multiple severe sequelae can be substantial. Whether the magnitude of the cost differential between trial arms is representative, will depend on whether the care requirements for these two children are typical. During the 6-month study period, we may have captured unusually severe manifestations of their chronic conditions, which if used as the basis of long-term cost extrapolations, could lead to erroneous predictions. For policy makers and health economists, the 6-month time horizon used in this study is a limiting factor and the uncertainties arising as a consequence of this should be borne in mind. Few comparable estimates of long-term resource use for this patient group have been reported. The NICHD follow-up study reported comparative data on the proportion of children receiving speech therapy at 6–7 years, but not on the number of contacts that took place.24 The proportions for the hypothermia and control groups of 30% and 43%, respectively were not dissimilar to those observed for speech and language therapy in this study; 25% (15/59) in the hypothermia arm and 48% (28/58) in the control arm. We followed convention for modelling costs and used a generalised gamma model with a log link function when exploring the relationship between healthcare costs and disability levels.25 Relative to children with no disability, progressively higher costs were incurred by those with mild, moderate and severe disabilities. Findings were again sensitive to the two outlying children; in their absence, costs for a child with a severe disability were estimated to be 14 times greater than for a child with no disability, rather than 27 times greater as in the base-case analysis. Our analysis has a number of limitations. First, the perspective for the costing work was restricted to the health service and excluded costs borne by the family and wider society. Table 2 showed that fewer parents of children in the control group were in paid employment, probably because of the demands of caring for an unwell child.26 This likely translates into a reduction of family income and an increase in expenses required to improve the comfort of the child.26–28 Furthermore, the caregiving burden often does not reduce as the child grows and can also impact the health of main carers.26 29–34 With this in mind and had it been possible to extend the perspective of this analysis from one of the health service to wider society, the findings reported here would likely have been strengthened. Second, these analyses used a subsample (130/184, 71%) of UK data from the 184 parents who consented to participate in the 6–7 years TOBY Children follow-up study. Analyses showed no significant differences between children whose parents completed the questionnaire in the UK, and in non-UK countries. There were also no differences between the 130 UK children used in the analysis, and the 39 children whose parents consented but did not return the questionnaire. Furthermore, and when looking between trial arms at differences in clinical outcomes for children in responding and non-responding families, the direction and magnitude of the differences observed were not dissimilar. Had these 39 children been included in the analysis, one might hypothesise that the findings would not have altered substantially. Third, it is important to consider the implications for the cost results, had it been possible to include the 45/229 (20%) surviving TOBY Children lost to follow-up. These children had more severe abnormalities on EEG at trial entry and lower scores on the Mental Development Index at 18 months.5 Based on the results in table 4 which showed higher costs accompany higher levels of disability, one can hypothesise that the mean cost estimates reported here would likely be greater had data from these children been available. With two-fifths of the 45 children in the hypothermia arm, and three-fifths in the control arm, it is also likely that the magnitude of the cost difference favouring hypothermia would increase. Fourth, the study relied on parents recalling healthcare contacts over the previous 6 months. We acknowledge that data for the analysis could have been obtained from routine national secondary sources; however, this approach had both cost and time implications and would also probably not have yielded the same richness of data provided by parents on additional care inputs required by their children (eg, respite carers, educational psychologists). Finally, some resource use data were missing and imputation of these data had a noticeable impact on a small number of cost categories. However, the magnitude and direction of changes were intuitive given the nature of the missing data and the observed distributions of complete data which informed the imputed values. This study is the first to report primary, community and secondary healthcare costs in children surviving 6–7 years after randomisation to hypothermia or standard care alone for perinatal asphyxia. Hypothermia was associated with lower costs, although the reduction did not achieve statistical significance and was sensitive to outlying observations. The study has also been able to quantify how healthcare costs increase with greater levels of disability and we believe this information will be both important and useful to those involved in planning patient care. In conclusion, this work provides previously unavailable data of interest to clinicians, health policy makers and health economists who may now wish to re-evaluate the long-term economic consequences of hypothermia for perinatal asphyxia. The authors would like to thank the children and parents who participated in this study and made this research possible. The authors are grateful to Omar Omar and Louise Linsell from the NPEU at the University of Oxford for kindly clarifying all our data queries. The authors would like to thank Ursula Bowler and Maggie Redshaw from the NPEU at the University of Oxford for comments on an earlier version of this manuscript. A full list of acknowledgements is provided in Azzopardi, D, et al 2014. Effects of hypothermia for perinatal asphyxia on childhood outcomes. N Engl J Med ; 371(2): 140–149. The authors would also like to thank the two reviewers whose thoughtful comments improved the content and readability of the paper. National Institute for Health and Care Excellence. Guide to the methods of technology appraisal. London: National Institute for Health and Care Excellence, 2013. Scottish Medicines Consortium. Guidance to Manufacturers for Completion of New Product Assessment Form (NPAF). Glasgow: NHS Scotland, 2011. Medical Services Advisory Committee. Technical Guidelines for preparing assessment reports for the Medical Services Advisory Committee – Service Type: Investigative. Canberra: Australian Government Department of Health, 2017.
. Hypothermia for perinatal asphyxia: trial-based quality of life at 6–7 years. Archives of Disease in Childhood 2018.
. Unit Costs of Health and Social Care. Personal Social Services Research Unit: University of Kent, 2016. Department of Health. NHS Reference costs 2015-16. 2016 https://www.gov.uk/government/publications/nhs-reference-costs-2015-to-2016.
. Statistical Analysis with Missing Data. 2nd ed. Hoboken NJ: Wiley2002.
. Economic Evaluation in Clinical Trials. 2nd Edn. Oxford: Oxford University Press, 2014. Optometric Fees Negotiating Committee. OFNC Press Release. 2016 http://www.fodo.com/downloads/ofnc-sight-test-fee-statement-final.pdf. Hampshire County Council. Educational Psychology Service prices. 2017 http://www3.hants.gov.uk/servicesforschools/education-psychology/education-psychology-prices.htm. OR-A and HC contributed equally. Contributors HC helped collect the unit cost data, conducted aspects of the statistical and sensitivity analyses, wrote the manuscript with OR-A, and revised and approved the final version for submission. OE helped collect the unit cost data, conducted aspects of the statistical analysis and revised and approved the final manuscript for submission. DA was the Chief Investigator of the TOBY Children Study, secured funding for the study, contributed to the design of the statistical analysis plan and revised and approved the final manuscript for submission. ADE was a Principal Investigator of the TOBY Children Study, secured funding for the study, contributed to the design of the statistical analysis plan and revised and approved the final manuscript for submission. BS was the study coordinator of the TOBY Children Study, monitored and supervised the data collection, clarified data-related issues and revised and approved the final manuscript for submission. OR-A designed the statistical analysis plan of the study, supervised the statistical analysis, conducted the multiple imputation method for the missing data, wrote the manuscript jointly with HC and revised and approved the final version for submission. Funding This study was supported by the United Kingdom Medical Research Council and the National Institute for Health Research Biomedical Research Centres at Imperial College London, the University of Oxford and King’s College London. Ethics approval The National Research Ethics Service in the UK and the relevant ethics review board at each of the institutions outside the UK approved the TOBY protocol.